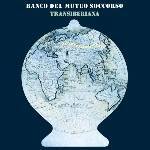 More information: 2019’s Transiberiana is the first album of new songs from Italian Progressive legends Banco del Mutuo Soccorso since 1994. Formed back in 1969 under the influence of British bands like Yes, Gentle Giant, Genesis, ELP and Jethro Tull, Banco integrated Jazz, Folk, and Classical elements into its sound and created genre classics such as 1972’s Darwin! 1973’s Lo Sono Nato Libero. Transiberiana - a highly personal and intricate concept album - picks up on Banco’s 1970’s classics and expands on them. Founding member Vittorio Nocenzi (piano, keyboards and voice) is joined by Filippo Marcheggiani (guitar), Nicola Di Già (rhythm guitar), Marco Capozi (bass), Fabio Moresco (drums) and Tony D’Alessio (lead vocal). Limited Edition CD in Mediabook with 44 page booklet (including photos from the sessions as well as English and Italian liner notes and lyrics. ).